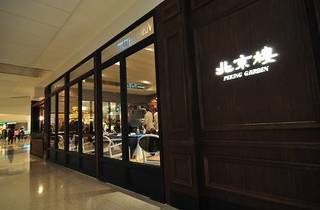 Towards the end of last year, Peking Garden swapped spaces with another restaurant in the basement of Pacific Place, settling into a smaller, more intimate space. The new configuration works much better for them than the previous massive dining room, which always looked empty. The dining room is sectioned into multiple areas, including a private library for semi-private parties, while the wainscot panelling and Pottery Barn tea lighting help create a charming atmosphere. On the menu, they make it very clear that there is no MSG used here. This is, of course, a good thing, but we reckoned they could have done without certain of the other ingredients used in some of their sauces. We started with a plate of smoked vegetable rolls ($68). To quote my dining companion, these were “chopped, bland-tasting vegetables wrapped in tofu skin”. This dish definitely needed sauce, and we really wanted to taste the smokiness the menu promised. We skipped the Peking duck they are famous for (we’ve had it many, many times before – it’s always excellent) and traded it instead for the Peking chop suey ($98) to be slightly ironic. 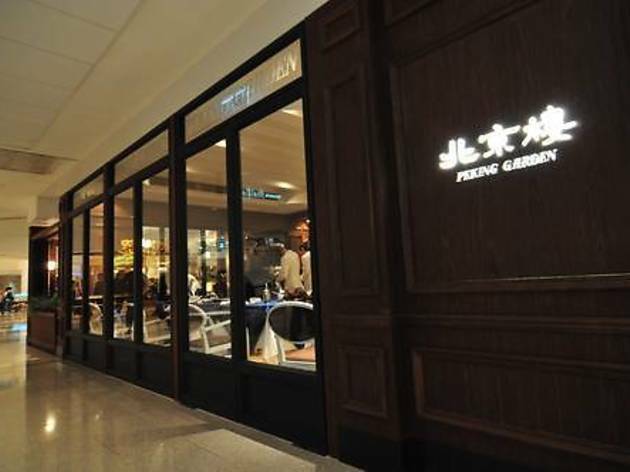 As this item does not appear on other Peking Garden menus, we wondered if this was a new creation designed to appease the expat and tourist crowd that frequent Pacific Place. Presentation wise, it is a Peking duck roll in every way, and is in fact designed to be an accompaniment to that very dish. However, if you order it a la carte (as we did), you’re left with a plate of stir-fried noodles and shredded vegetables topped with a scrambled egg. We were then given four flour pancakes to build our rolls, altogether very tasty, not too oily and great as a side dish. Unfortunately this was our main, so bad ordering on our part. The next dish, marked simply on the menu as ‘grilled fish’ ($85) seemed more deep-fried than grilled. In fact, we’d wager it was definitely deep-fried, as – in our experience – there is no other way to achieve the thick crispy outer skin without throwing it in a vat of scorching oil. With the head removed, you’re supposed to eat this whole: bones, fins, tail and all. Small bites are best, as while the bones and fins create a pleasant texture in the mouth, too much can cause a choking hazard. Also here’s a hint: make use of the scallion shavings, they may look like garnish, but they actually enhance the flavour. In sum, the value is fantastic for what you get in this setting, and, while we had some minor grievances, we still left feeling satisfied. Shop 005, B/F Pacific Place, 88 Queensway, Admiralty, 3741 1928. Daily-11.30am-11.30pm. Meal for two: around $500.